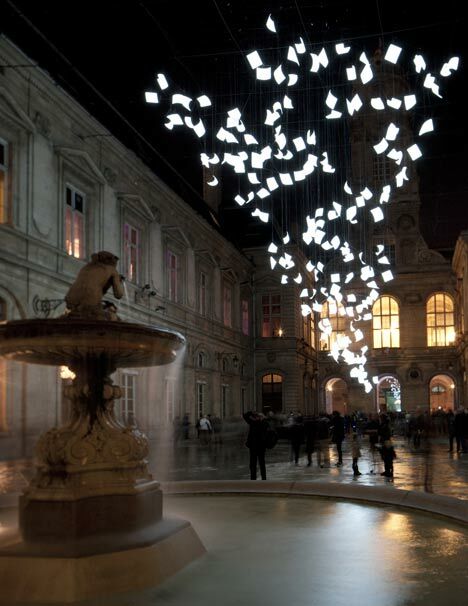 It’s difficult to look at Cocksedge’s installation piece without being captivated by its fantasy and whimsy appeal. It brings about a sense of romanticism as if looking at a computer edited scene from a film or perhaps and still captured from some sort of dream; I’m personally reminded of something that would come from an animators imagination – as if something from a Disney film (possibly due to its resemblance to this scene). 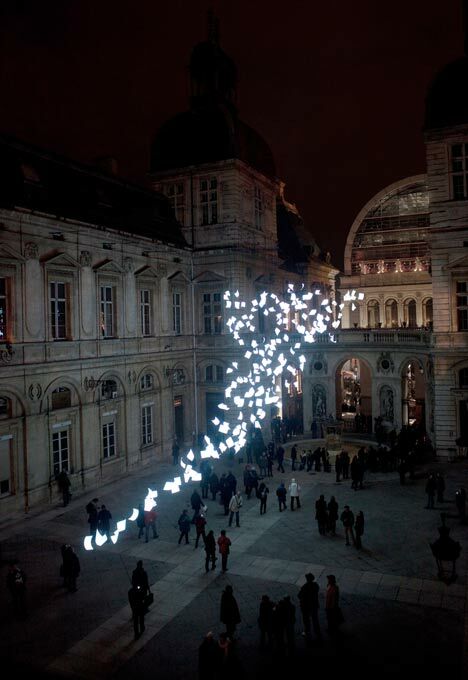 Set in the architectural city of Lyon, these 200 sheets of electrically conductive, luminescent material succeed in their illusion of drift despite remaining static within the Hotel de Ville courtyard and was sure to captivate its viewers. 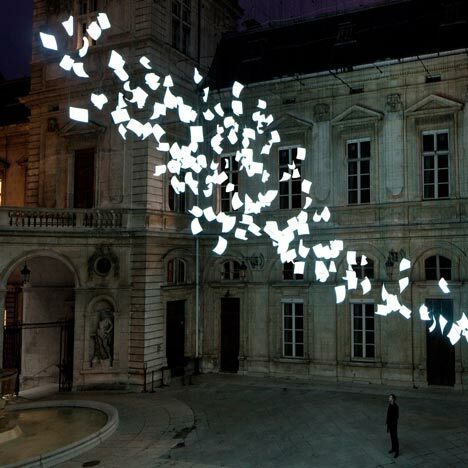 It was created as part of the Lyon’s annual Fête des Lumières which ran from the 8th to 11th December last year. And each A3 size equivalent sheet was said to have been moulded by hand prior to installation, which only adds to its impressive nature. 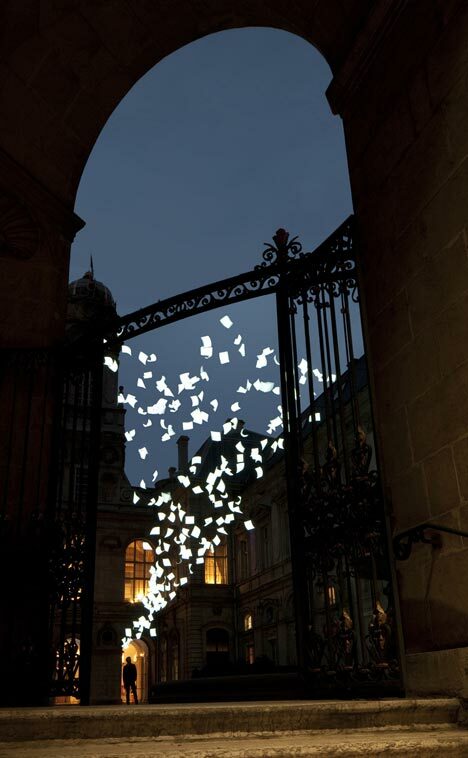 By combining the his interest in the morphology and movement of paper and light, Paul Cocksegde has created this 25 metre long, 15 metre high piece by using what is known as electroluminescent (EL) material by which the material emits light upon a passage of current. 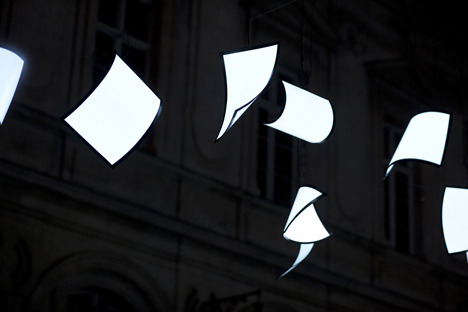 Bourrasque in particular utilises this material property as it enables each sheet to be thin and flexible and therefore easily malleable. Be sure to visit other work by Paul Cocksedge and his website here.